I think we've seen some pretty interesting results in the women's game this clay-court season—particularly in the past few weeks with Maria Jose Sanchez Martinez and Aravene Rezai winning huge warmups. 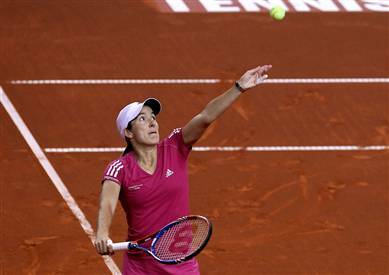 Another big event was taken by Justine Henin, who's looking to be this year's version of a Belgian coming back from retirement and winning a Slam. Yeah, I know: Schiavone's a stretch, but I don't think Victoria Azarenka or Caroline Wozniacki are match-ready to come through the weaker side of the draw. That's how I see it. 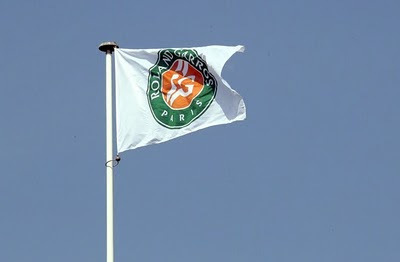 Enjoy the first day of the tennis! Rafael Nadal. Who else could it be? I guess you could've said that last year, too, but we all know what happened then. Nothing's ever a given in pro sports, but I do think Rafa is a great choice to win it all, based on his overall ability on the clay courts. Plus, I'm sure there's going to be an extra bit of motivation going in, looking to erase what happened last year. *A side note: You may be saying, "What about Djokovic? Verdasco? Roddick? Gasquet over Murray?" Here's my thinking along those lines: Nole's not match-tough, Verdasco's played too much, Roddick not enough and Gasquet won't be able to handle the pressure. Anyway, the women's picks are coming next! As we all know, the French is just a few days away, but before that all gets going, I thought I'd take a little look at the qualifying rounds for the tournament. I'm always fascinated by the qualies at Majors because there's such an interesting and varied look at the dynamics of sports all wrapped up in one package. You have the young up-and-comers looking to make a breakthrough and the veterans looking for that one last shot at the big time. There's also the guys that are in their prime age-wise, but it hasn't happened for them yet, and possibly never will. Then you have the ones trying to rebound from injury. It's kind of like watching "Bull Durham," but for tennis! • Jose Acasuso: Anyone that's watched his Davis Cup struggles has to be pulling for that guy! • Ryler Deheart: That TENNIS magazine article a couple of years ago said he was making burritos at a Chipotle restaurant recently. How could you not hope he makes it in? • Alex Bogomolov Jr.: Ashley Harkleroad's ex-husband and Anna Kournikova's cousin needs that big break. • Michaella Krajicek: She never did make it to the big time, and actually barely made it to the medium time. She's still kind of young, so who knows? • Bethanie Mattek-Sands: Sure, she dresses wacky, but to me, she seems kinda cool, like someone you'd want to hang out with. • Kaia Kanepi: From French quarterfinals to French qualifying hopeful in the span of two years: Good luck getting back to the big time! Rafael Nadal and Venus Williams have both made the finals in this week's big event in Madrid (not against each other, silly!) It's been a big week for both of them because they each reclaimed a familiar spot in the rankings during this tournament: getting back to the number-two spot behind Roger Federer and Serena Williams, respectively. You have to wonder, can they both reclaim that top spot? Based on form alone this year, I would definitely say so. You can almost consider them de facto number ones, in my opinion. Sure, neither one of them won the Australian this year, but look what they've done compared with Federer and Serena, whose only titles of 2010 came at the Aussie: Despite concern about his health and going without a title for a year, Rafa's won two ATP 1000 singles titles, won the doubles at another and firmly without a doubt established himself as the overwhelming favorite to win the French. Venus defended her titles in Dubai and Acapulco. And sure, those aren't the biggest crowns on the block, but to win a hard-court title one week then pick up some hardware on the dirt the very next week is an impressive accomplishment. She then went on to make the finals at one of the biggest stops on either tour in Miami. Granted, things have been tough for Federer and Serena after their Slam wins. But Rafa's scheduling and pacing has been impeccable, and Venus is taking it back to 2001 with her play. If they end up on top, I wouldn't be surprised. TopSpin of Tennis is Served ... left me a comment in my previous post about how I said I'd be back in a few days, and implied that I might've been a little optimistic with that statement. Man, was he right! That post-marriage business is nothing to play with! But back I am, and ready to get to posting. A lot has happened in the tennis world during my journey to wedded bliss: Heck, a lot has happened today with Roger Federer and Jelena Jankovic being upset in Estoril and Rome, respectively. 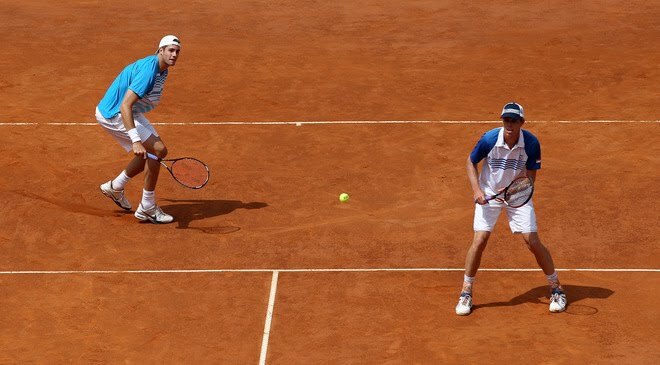 But the biggest thing to me, honestly, over the past week or so—if not the year—is John Isner and Sam Querrey battling through to the finals at the Serbia Open. Running a close second to that? Those two making the finals in doubles at the Italian Open. You see, their recent runs of good form on the dirt kind of support what I was saying when I thought the U.S. team would be able to beat Spain in Davis Cup a couple of years ago and Serbia this year: Big serves plus big forehands should equal success on clay. I'm no pro, but it seems to me if you can hit kickers that can bounce at shoulder height to the receiver or blast bombs up the tee and open up the court to crank a forehand, then this should be one of the easiest surfaces for U.S. guys to win on. I know movement poses a problem, but that brings to mind a way-old article I read in Tennis magazine talking about U.S. players struggle on the slippery stuff. In the story, which was from the late '80s, a U.S. player said he was talking to Ivan Lendl about his strategy. Lendl said he didn't bother with all that sliding: Just set up and whack the ball. Look at the 1991 French Open final between Andre Agassi and Jim Courier, the last time two Americans played a European clay-court final: Not much slipping and sliding going on there! Courier defended that '91 victory in 1992 with one of the most dominant performances I've ever seen in tennis.